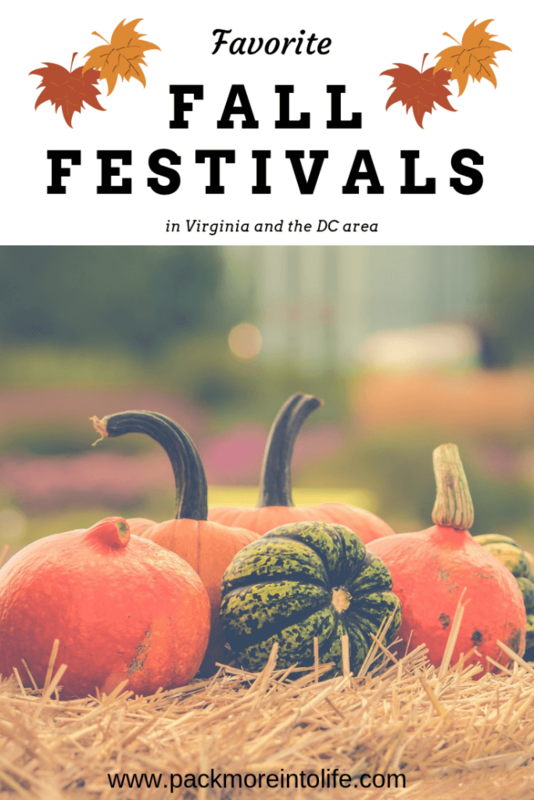 There are so many fantastic fall festivals in Virginia and the DC area. It’s hard to sort through them all and decide what is best for your family, so I am here to help! We have visited all of the festivals and events below. You’ll find a quick summary of each fall festival and then a link to a detailed post about each. Hopefully, you can find a pumpkin festival in Northern Virginia that you love! Why? This is one of the largest festivals in the DC area. It is well attended by the families in the area, so watch the calendar for dates that are the busiest (weekends in October). Best for kids aged: It is best for preschool-aged children up to elementary school children. There is a toddler section, but I wouldn’t pay the high cost of a ticket for only a toddler (unless you had an older sibling). Cost: The price varies from $6 (during the week) up to $20 for peak days (weekends in October). Check the Cox Farms calendar to determine the best time to go. Also, watch for the special weekend where they offer discounts for military/EMS/Police/Teachers. Why we love it: Cox farms does a fantastic job at keeping everything neat and orderly with so many visitors. We love the ride attendants that help keep the lines organized and all the little ones safe. We also love how creative the grounds are with something for everyone. It’s a favorite for many families and multiple generations. Tips: Try to avoid the busy weekends, bring a picnic and enjoy the music bands. Arrive early to get the most out of your day and avoid rainy days because they close the signs when it is raining. Want to read more? Head over to our blog post to read about Cox Farms in depth. <—–click the link! Why? If you are looking for a laid-back farm experience, then this is the place for you. The jumping pillow is huge and a ton of fun, we also really like the multiple play areas, farm machines to climb on and explore, as well as the slides. They provide educational programs and are just down the road from a fabulous brewery. You honestly can’t beat a farm and brewery day (that’s also kid friendly)! Best for kids aged: It is best for preschool-aged children up to elementary school children. The grounds aren’t ideal for toddlers, but if you have an older sibling, then I’m sure the toddler would enjoy the corn crib, smaller playsets, and the climb on farm machinery. Cost: Free for military service members and their families, otherwise it’s affordable at Weekday Admission: $8/child & $10/Adult and Weekend Admission: $10/child & $12/Adult. Kids under 2 are always free. Why we love it: We love Great Country Farms because it feels like going to visit a family farm. The country store is welcoming with handmade goods, the people are friendly and love working there. It is more like a working farm than a tourist attraction, which is a breath of fresh air. Tips: Bring clothes that the kids can get dirty. We encountered plenty of mud and puddles. We’ve heard the weekends can also get busy when it is nice outside, so arrive early to enjoy a bit of fun before the crowds set in. Want to read more? Head over to our blog post to read about Great Country Farms in depth. <—–click the link! Why? This is our favorite pumpkin playground that is close to the DC area. They have plenty of parking. The nursery is so cute with slides, playgrounds, a big sand hill to dig for coins, tractor rides, and animals. Best for kids aged: This is the place I recommend for toddlers and preschoolers. Bigger kids will still have plenty of fun, but it is a smaller space to explore, and with only a few longer slides, the thrills aren’t as immense. Cost: Weekdays is $10 per person and the weekend price is $14 per person. Military service members save $1 off admission. Why we love it: It is one of the closest to the DC area and easy to visit mornings or afternoons. It is simple and easy to keep track of school groups or larger families. On the weekends they have pony rides. Tips: Arrive early. We arrived at 9 am on a weekday and had the place to ourselves for almost an hour and a half. By 10:30, it was busy with lots of school groups visiting. Want to read more? Head over to our blog post to read about Burke Pumpkin Playground in depth. <—–click the link! Why? Nalls is a family-owned garden center that has a fabulous and cute little pumpkin play area in Alexandria. You’ll find tunnels to explore, hay to dig through and find coins, Halloween decorations, a great pumpkin photo display and animals to visit. Pop into the store to enjoy some farm fresh produce. Best for kids aged: This is my recommended spot for babies and toddlers. It is a small area to explore and easy for kids to touch and feel various pumpkins. Why we love it: This is one of the few FREE places to visit in the area. Tips: Bring the kids all dressed up to get some adorable photos with the pumpkins, in the hay or near the pumpkin display with crates. Want to read more? Head over to our blog post to read about Nalls Pumpkin Playground in depth. <—–click the link! Best for kids aged: This is an event for all ages! We see families with little children all the way up to teenagers. Lots of family costumes! Why we love it: Yes it can get crowded, but the event is well organized with lots of staff on hand to keep everything running smoothly. We like the multiple entrances to start your evening exploring the Zoo. We love visiting the animals during non-peak hours. The small nocturnal animals were super active, which was really fun. The volunteers passed out not only candy but fruit treats, popcorn, pencils, and stickers. A nice variety. Tips: Be sure to purchase your parking pass (only available for members) early. It’s just a 3-hour event, so I’d suggest arriving a bit before 5:30 pm when they open. The lines are long to enter, but it goes quickly once the event opens. Bring warm clothing because it gets cold quickly. Also, bring a stroller or wagon because it’s a large zoo and the little feet won’t make it very far up the hills. Want to read more? Head over to our blog post to read about Boo at the Zoo in depth. <—–click the link! Why? There is something magical about trick or treating on the historic property. Not only will your children have a basket full of candy, but they can also take a wagon ride, make a Halloween craft, watch traditional 19th-century crafts and join in on a children’s costume parade. Best for kids aged: This is another fun family event for children of all ages. Probably best for the elementary ages kids, but we’ve gone since our son was a baby. Who doesn’t love dressing up? Cost: $14 for adults and $8 for children. Under two is free. Why we love it: We love enjoying the traditional Mount Vernon grounds with our family. It’s a fun event with so many things to do other than getting candy. Tips: Arrive early to secure a parking spot and get a map if you’ve never been to Mount Vernon. Want to read more? Head over to our blog post to read about Trick or Treating at Mount Vernon in depth. <—–COMING SOON! Did you find this post helpful? Let me know in the comments, and I’ll write more! Want to stay in touch and get updates? Find me on Facebook or Instagram! You can also join my newsletter, I promise I won’t spam you. Want to read more about our travels? Head back to our destinations page!